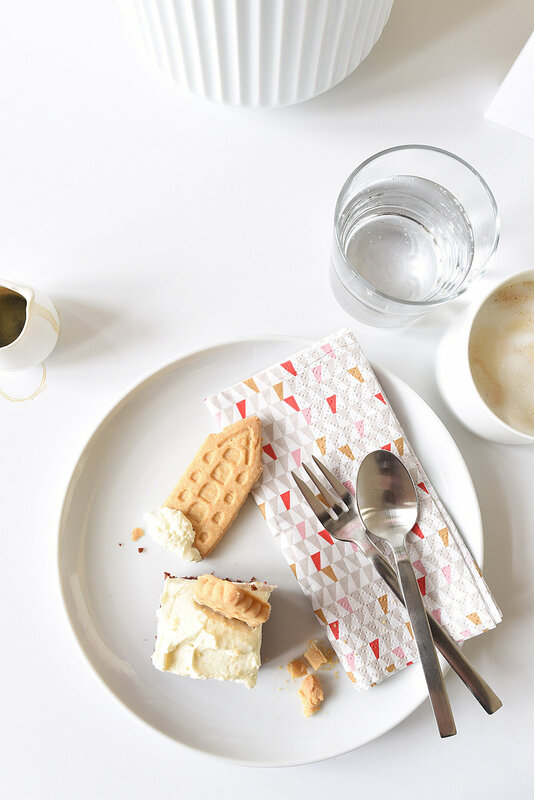 Hello everyone, it's Anke and I'm here today to share my once-monthly column about tabletop styling and food. I'm German, yet our annual family summer vacations in Holland for the past thirty-seven years (I'm only 40!) shaped me and my sense of style. I love the the laid-back, relaxed and joyful lifestyle of the Dutch and whenever opportunity arises to visit Amsterdam I use it! 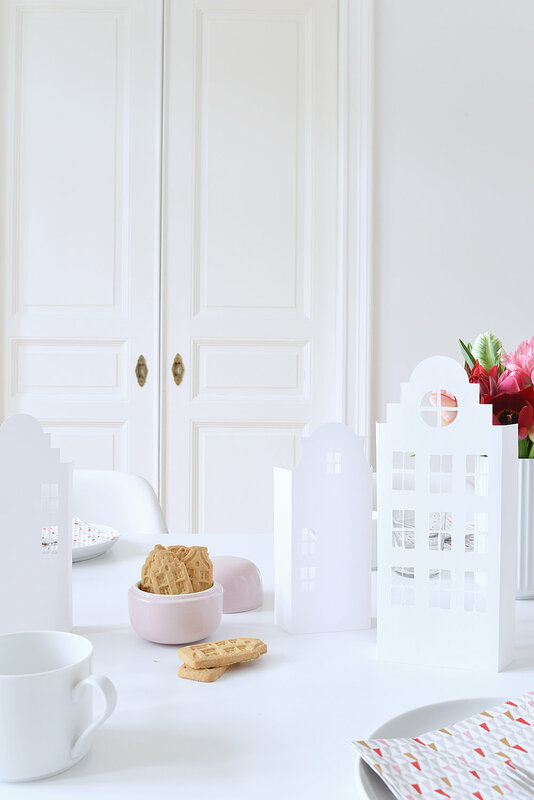 For March, I've created an Amsterdam-inspired tabletop idea to inspire you for spring. I ended up finding a Dutch Canal House Luminaries DIY at Kate's Creative Space. All you have to do is to print the templates and cut out the houses/ windows. Lucky for me, cutting out the small windows a little inaccurate gave my houses an even more charming look! Haha! Happy accidents are nice, aren't they? There is no Dutch-themed table decoration without tulips, agree? 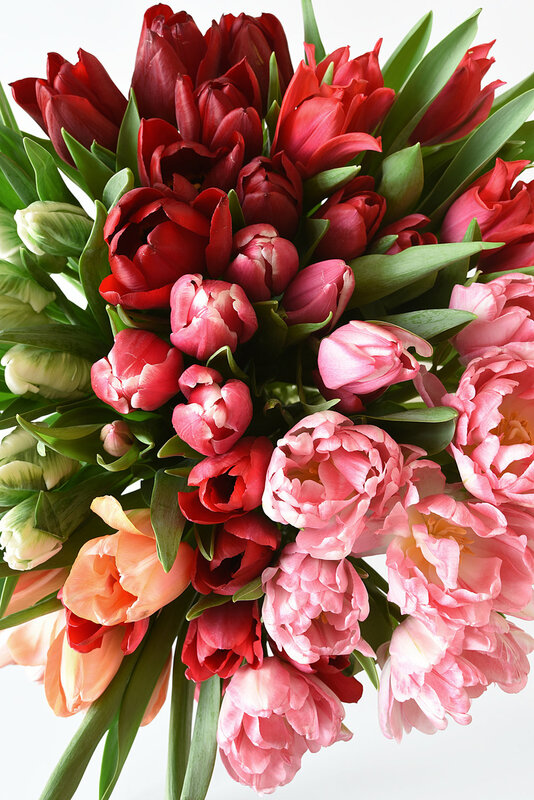 In our local flower shops we are experiencing tulip high season right now and one can draw from the full range. I picked different shaped tulips in rich shades of pink and red and placed them in my vases from Lyngby Porcelæn. Furthermore a little treat in the form of Chocolate and Beet Brownies with a cream cheese topping and cute canal house biscuits for ornament went on the table for my afternoon coffee gathering. You will find the brownie recipe at La Tartine Gourmande. The pretty chocolate bars you see on one of my images are from PLUK Amsterdam, definitely one of the most popular locations for breakfast, lunch, coffee&cake and decoration shopping in Amsterdam currently! They also run an online shop in the meantime. Their chocolate, postcards and candles are the perfect souvenirs! The bars are the perfect hostess gift to your guests.